David and Cian and I just dropped the girls off for their first day of the new school year. First and second grade. 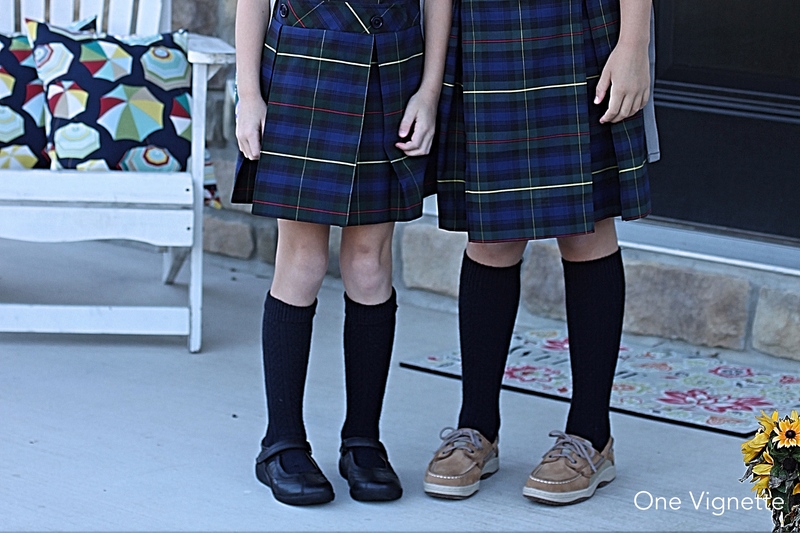 Tiny plaid uniforms. Backpacks that still look a bit too big for their little bodies. Saoirse told me last night that she wasn’t ready for the year to start–this summer had been too nice. Too much fun. “Relaxing,” she said. You know already that I felt the same way. I wasn’t the Author this summer, or really even the Author Mom. I really didn’t have a choice to be anything other than Regular Mom once vacation started, and while I’m not so sure I want to know what that means for a burgeoning writing career, these past weeks were some of the best that I can remember. Maybe it’s because I didn’t have a choice: I had to be in the mix with these three kiddos whether I wanted to be working or not, so I just gave myself over to it. It was the first time since I started writing toward publication that I didn’t feel utterly guilty, like I was failing at something. I guess it showed. Quinlan said last night that she was nervous for today, but that it was an excited nervous, the butterflies-in-your-stomach kind (Saoirse said that bad nervous felt like fireflies in your stomach, so butterflies are much better). They had smoothies for breakfast. Saoirse was able to get hers down, but that was it. Quinlan didn’t drink hers, but managed a scrambled egg (microwaved in a mug, happily prepared by her big sister). David said it reminded him of his own first day of school, when his mom would get up early to cook him a special hot breakfast, and he’d be so nervous he could barely get it down. The girls. So happy. So nervous. They said hello to the teacher from their kindergarten days, who was on parking lot duty for the first week. We greeted the principal, and the church pastor, both with smiles on their faces. Saoirse asked that I not make her and Quinn stand in front of the school to take their picture, and I swallowed hard and gave her a hug. 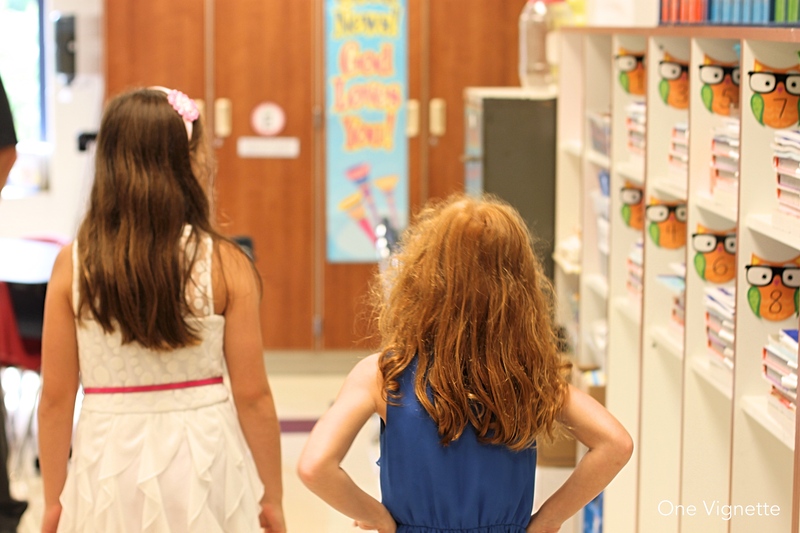 And then I watched my girls walk into school and I burst into tears. I mean, tears. In public. In front of people. Who does that? I never have. It’s just: First grade. Third grade. Already. We got back to the van and I straight-up ugly cried. David just walked into my office and dropped a kiss onto the top of my head. He said: it’s so quiet. I’m used to having them around. This is a good thing, but…it’s just so quiet. Cian is sitting on my lap right now, watching me type. 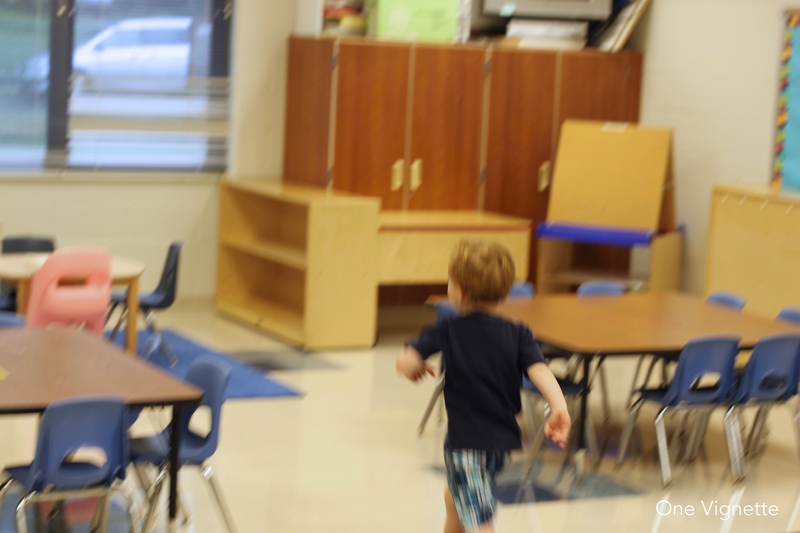 He starts preschool in a couple of weeks. Just a couple of days a week, but here we go. It’s going to be quiet. Maybe it wouldn’t feel so strange if David and I weren’t both home during the day. Maybe if we were both out of the house, working away from home rather than right here, right in the middle of where we live our lives every day, we wouldn’t be so emotional. But probably still so. It all goes by so quickly. I don’t think I’ve ever had this rough a time with it. I mean, there are always a few tears when this milestone comes, but enough already. This is embarrassing. This morning after we came back home, I sat down here, at my desk, and opened my laptop. Cian brought in a few toys and started playing at my feet, talking to himself mostly, and sometimes to me. I watched the school bus go by outside the window, carrying the public elementary school kids who start their own first days today, too. Parents posted pictures to Facebook of smiling kids, of handheld milestone signs, of themselves leaping in the air for joy. And I wondered why I’m having such a hard time this year until: I started out as a stay-at-home mom to one. And now there’s just one at home. Dude. That happened fast. So now I sit here while Cian curls himself into a ball against my chest, clutching his stuffed T. Rex. “I miss my sisters,” he says. I tear up again, on cue, but tell him that it’ll be okay. That he’ll see them soon. And I turn again to my laptop, open up a new page, and I do what comes next.